More information about the board can be found at the V2M Beetle Website. 2MB of external QSPI flash. Other hardware features are not currently supported by the port. See the V2M Beetle Website for a complete list of V2M Beetle board hardware features. Beetle is a Cortex-M3 based SoC and has 15 fixed exceptions and 45 IRQs. 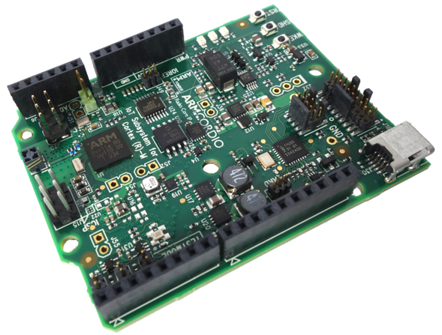 The ARM V2M Beetle Board has 4 GPIO controllers. These controllers are responsible for pin muxing, input/output, pull-up, etc. For mode details please refer to Beetle Technical Reference Manual (TRM). V2M Beetle has one external and two on-chip oscillators. The slow clock is 32.768 kHz, and the main clock is 24 MHz. The processor can set up PLL to drive the master clock. The ARM Beetle processor has two UARTs. Both the UARTs have only two wires for RX/TX and no flow control (CTS/RTS) or FIFO. The Zephyr console output, by default, is utilizing UART1. A USB connection to the host computer, which exposes a Mass Storage and an USB Serial Port. This interfaces are exposed via CMSIS DAP. For more details please refer to CMSIS-DAP Website. You can build applications in the usual way. Here is an example for the Hello World application.